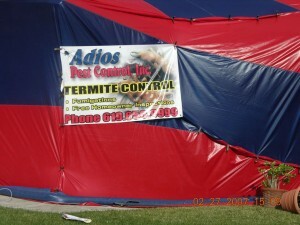 Adios Pest Control provides complete solutions to your termite problems in National City. We are one of the leading National City termite control companies in the county. Our team will conduct fumigation, inspections, treatments, and repairs to areas damaged by these pests. In National City we also offer termite inspections and structural repairs. Our team will distinguish different termite species so you can choose the most appropriate treatment for your home. We even provide termite prevention plans to make sure swarms won’t infest your home when the weather turns humid. Contact us to learn more about our services in National City and surrounding areas or call at (866) 955-7378.